SharePoint is Microsoft’s No. 1 collaboration platform. Just like most other products from the company, it is also packed with lots of user-friendly features. Then why does it get a bad rap from many business owners out there? We searched for the answer and came up with a bunch of myths, which separate the expectations from the platform and the realities by more than a mile. Here are the top 5 among them. If this is all users expect the platform to be, they will miss out on most of its powerful features. While the platform does provide powerful file sharing features, it is also well-suited for team collaboration, enterprise content management, and a whole lot more. Plus, if a functionality required by an organization is not available, developers usually have the option to make it available through custom web parts/add-ins. Nothing could be further from the truth! The look and feel of the platform depends entirely on how it is configured and deployed. There are plenty of options available for customization, including custom dashboards, project management systems, web parts, enterprise search, and a whole lot more. All it takes is a team of skilled programmers to utilize them properly. SharePoint was designed by Microsoft to be approachable by every employee of an organization. Once the IT team is done with deployment, everyone should be able to use the platform to collaborate and share resources on a daily basis. However, during the initial stages, some training may be required to help users learn the best practices regarding SharePoint usage. SharePoint was initially launched as a platform to use for building an intranet. However, following the recent integration with Office 365, it can be used to build anything from websites to line-of-business systems. What’s more, users can also access SP sites on mobile devices, with the help of the official mobile apps. What’s necessary is a deep understanding of the features and functionalities of the platform, and developers capable of working with it. Once again, this could be regarded as true in the past, since the early versions of the platform required major infrastructural setups. However, that picture has changed quite dramatically since the launch of SharePoint Online. The platform is now much easier to manage and work with. Besides, the seamless integration of the platform with Office 365 means collaboration on documents is a breeze. This holds true even if a lot of employees work from their homes, which is quite common among smaller organizations. 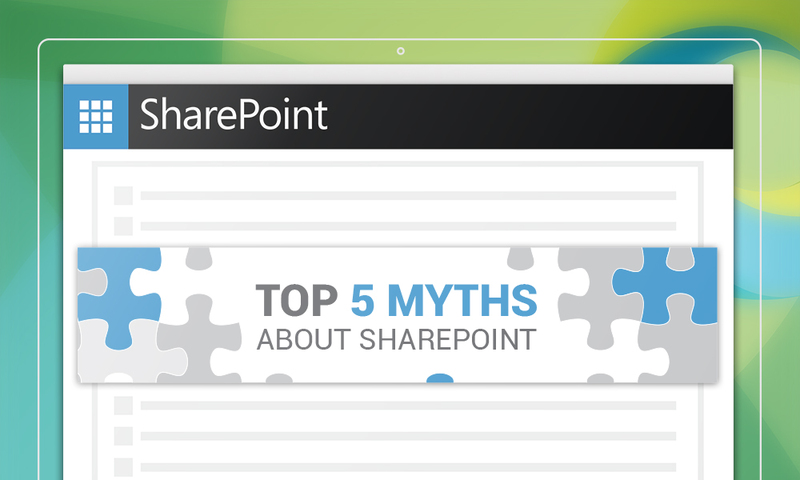 Those were the 5 most prevalent myths about SharePoint that we came across in our research. Think we missed something? Let us know in the comments below. Also, if you are looking for an enterprise grade SharePoint chart web part that offers you 56 chart types and supports most popular data sources, do check out our flagship product. We also have a separate app available for SharePoint Online, in case you are looking for one.